Lanzarote is awash with texture and martian colours. Nowhere is this more distinct than the Green Lagoon just outside the town of El Golfo. I arrived there around sunset and the sun setting illuminating the rocks was a sight to behold. 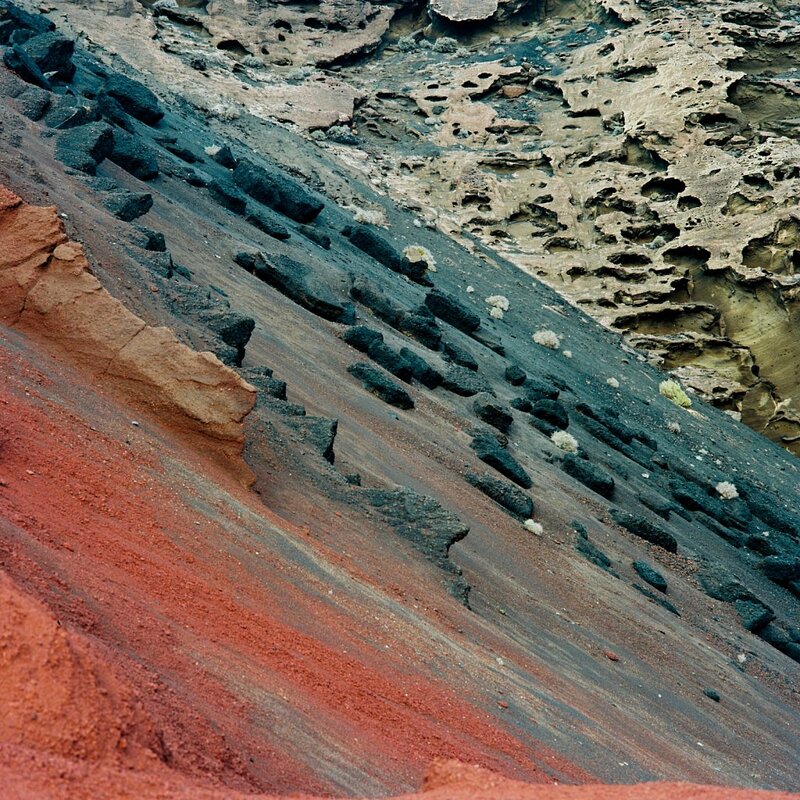 The details of the red, blue and brown volcanic rocks drew my eye and soon the Bronica was mounted on my tripod with the 150mm lens pointed at an intersection of colours I found particularly interesting . This was actually one of the images I was looking forward to seeing most when my film returned from the lab especially to see how Kodak Ektar rendered the colour. Opening the high quality scan on the CD that Peak Imaging (who I've used quite alot this year for my process and scanning) I was taken aback. Those vibrant tones! But then I realised there was a mark in the center of the frame. Checking the negative, clearly something had gone wrong, with a dark mark and halo effect around it. Things can go wrong in many places when shooting film and the feedback loop is pretty long. Unfortunately I'm not in the habit of bracketing most of my shots so I understood that regardless of the root cause Photoshop's clone tool would be the solution. Still I was interested to hear what the issue was so I sent it back to the lab for their inspection. Great customer service, in my opinion, should be primarily judged on when there is a problem for the client. This was the first issue I'd had in the many years and rolls of film I had sent to Peak Imaging and so I was keen to see how this was handled. The negatives and CD were sent back to them using their freepost label and within a couple of days one of the lab managers called me with his feedback. I had a good conversation with him and he described how he was quite perplexed by the mark as being on frame 8 of the roll it seemed unlikely to be a processing issue. Perhaps the roll itself had a manufacturing issue. Anyway he offered to digitally fix the image and produce me a 10x10 print of the image which was very welcome and despite not being able to offer a clear theory as what happened I appreciated the thoroughness of his explanation for what it could have been and why each scenario had reasons to be unlikely. Digital saved the analogue day!